Yep. Definitely feeling all of that. How are you liking the Rubberneck? I got one myself recently am decidedly a fan. Thanks! I am also a fan of the Rubberneck. I think I sometimes like the idea of using delay better than I actually like using delay... and I think most of that has to do with overthinking how to use it. For me, the Rubberneck simplifies the process of using delay in a musical way. I also bought the FS3X which makes it even more useful. 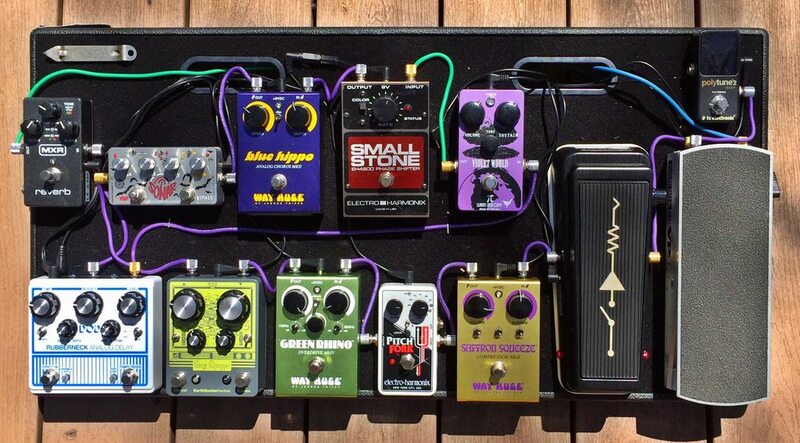 After watching the (above) Coxon video I decided to re-do my pedal board. My main board is in a state of flux...in the meantime, I put together this "nostalgia" board, with effects from a long time ago. That GLX Flanger was my first pedal. Selling it off to a friend for £20. 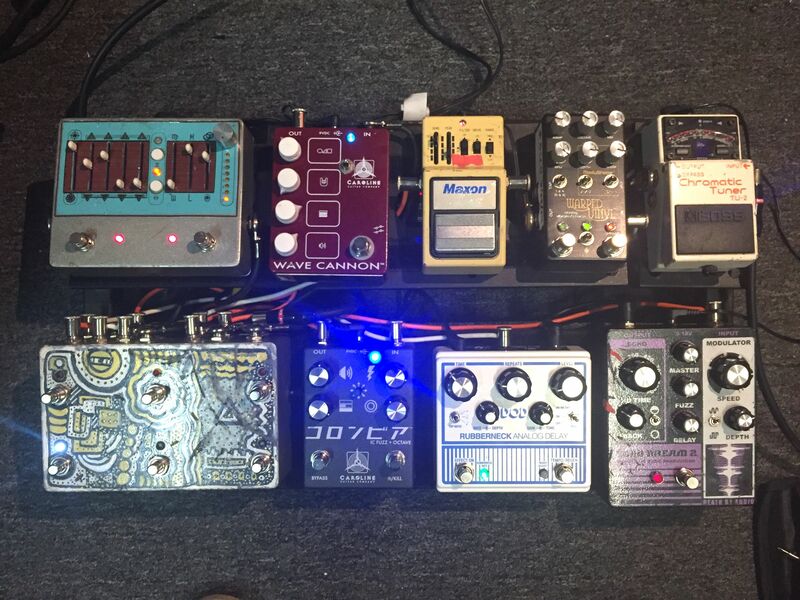 here's my pedalboard as of a few minutes ago. NPD was a few days ago, where i struck gold and got an original 1978 MXR Flanger for chump change in Mexico. Wish I had room for more stuff! Caroline Co. sweeping me off my feet with their dirt. 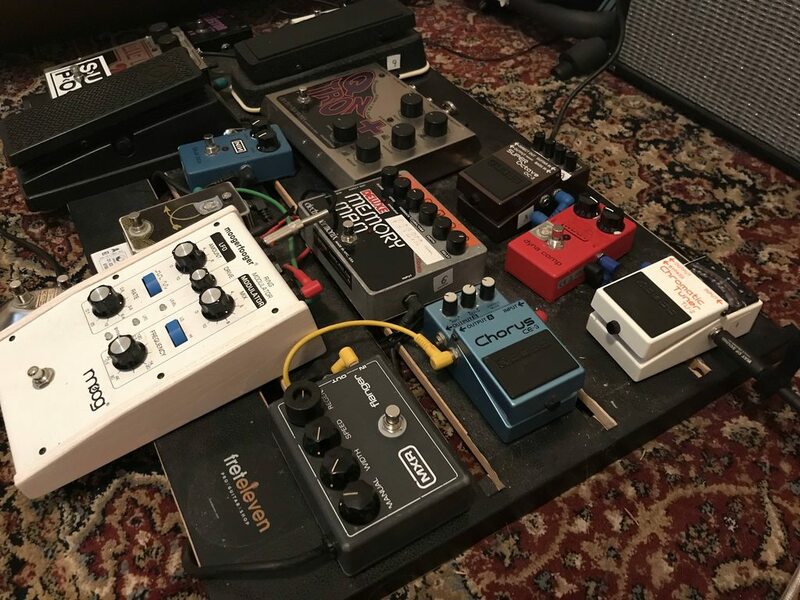 I saw some of those pedals on ebay yesterday. Did you see the prices? I really don't want to sell any of them!! They weren't that bad, well compared to my local prices. I just use the Line 6 HX effects multi-effects pedal. It sounds good and is very easy to use. Is anyone else using it? My main board was in pieces for months as I re-thought my home rig. I tried this and that, bought and sold a few things...kept some other things. What I arrived to wasn't radically different to my board for the past 4 years at all. I upgraded my old Echoczar and Angelbaby to the Xv version after my name finally came up on the Echoczar list. I did away with the extra OD I had and the old Fuzz (both where BJFE), and stuck the Way Huge Piercing Moose on in their place. Really proud of this board. Isn't that crazy how that happens? I did the same thing earlier this year. I always seem to come back to my old standards that just plain work with my other gear. I used to have that exact same amp/cab combo for my bedroom (except my ZVex was blue and my Orange cab was orange). Those little ZVex amps are surprisingly versatile, and they sound great.